Transit maps in Marin are, well, not very good. Especially for the uninitiated, they can be confusing spaghetti. About a year ago, I was contacted by a young man in Novato who had his drivers’ license suspended for some reason and wanted to know how to get around to his destinations. He went to school in College of Marin, worked in Petaluma, and hung out with his friends in the East Bay. How was he supposed to get out of Novato without a car? After an abortive attempt at a Novato spider map, I realized all I needed were the various connections between the destinations so he could know exactly how he could get from A to B without all the mess of geography. The map below is the result. It’s simple, so it doesn’t include things like frequency or span of service. Instead, I wanted to show how to get from place to place, major stops, and where those routes went after transfer points and destinations, without all the fuss of a more detailed map. Were I to make this again, I would probably place 49/49K to the west of the 101 corridor north of Ignacio and east of it to the south to reflect actual geography, but as it stands I think there’s enough hints for the user to see where the bus goes. I’ve never followed up with him to see how it went, though he seemed pretty excited to see it. Perhaps it will be of some use to you as well, as it’s now up in the Map Room. 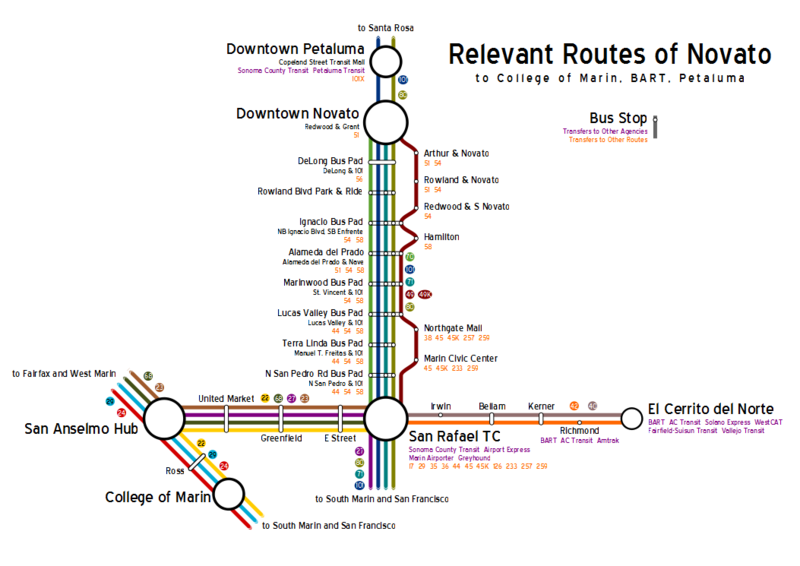 Here’s a personalized map request for you: how do you get to College of Marin from SF in a reasonable amount of time– maybe even using a bike for the last-mile problem.